The King's regiment of Heavy Cavalry was the oldest in the Kingdom, having been raised originally in Milan, then controlled by the Spanish, in 1536. 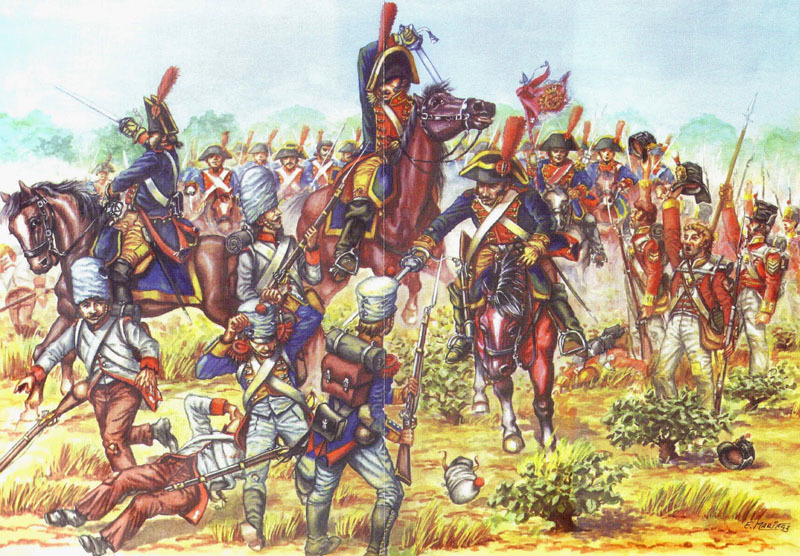 It was part of the Spanish forces sent to Denmark in 1807 under the Marquis de la Romana. It was returned to the Peninsula, sons horses, by the Brityish in 1808, and, after securing remounts, it fought at the battles of Ucles, Medellin, Talavera, Ocana, and Sagunto. For the duration of the Peninsular War, the regiment wore this uniform - dark blue coats with red collar, cuffs, lapels and turnbacks, brass buttons, buff breeches, and yellow edging to the bicorne and saddle blankets. These are more excellent 28 mm Brigade Games figures, sculpted by Paul Hicks. Note the detail on the pockets on the back of the coats! The unit should have 2 more figures, a trumpeter and a standard bearer (plus an officer, which I recycle as a General!). I have been waiting for Brigade Games to release the command set for these troops since July, but nothing yet. With the local version of the Talavera "Campaign in a Day" in 2 weeks, I just went ahead and painted the troopers without the command. If need be, I can use the Dragoon command set, as there seems to be little difference in the cut of the uniform. We will see. Brigade games has been releasing quite a few Spanish/Peninsular War figures this month! The flag for this unit has the emblem of Milan on the reverse - a snake swallowing a man, a nod to it's origin in that city. The regiment performed what was perhaps the most effective cavalry charge by the Spanish of the war at the battle of Talavera, where it scattered the infantry of the Confederation of the Rhine and captured a battery. Your Spanish army is progressing nicely and these cavalry are a fine addition to the collection. Thank you Jon. The Army is in the home stretch now; mostly the Cavalry and some more militia left to go! I painted these same fellows for Talavera in 15mm. It's nice to see a Spanish unit that performed well! Thanks, Scott. The Spanish cavalry as a whole had an undistinguished record during the Peninsular War, but this unit seems to have been the exception. Very nicely done, and I especially like the choice of blue you have used here Peter. I think I used Michael's Craftsmart Navy Blue, enhanced with some drops of Delta Ceramcoat Utramarine. I like the uniforms a bit "blue-er" than the real life ones so the color is easier to tell. A very vibrant looking group. I agree the brighter colors are better for the smaller scale. Thanks, Jake. Even more true in scales smaller than 28mm! A lovely looking cavalry unit, really like the colours! Glad you liked them, Iain!